A review of Julia Nardin’s play, staged by Seattle Immersive Theatre at a Sodo warehouse. Though the appeal of a show from Seattle Immersive Theatre can likely be chalked up to its unconventional interactive nature, many of the pleasures of its latest work, “Dump Site,” are purely fundamental. Yes, the audience of less than two dozen people is allowed to wander the sets during the show and encouraged to pick up and examine the props, but immersion is achieved in a way chosen by many “normal” plays — compelling characters imbued with intriguing inner lives by talented actors. 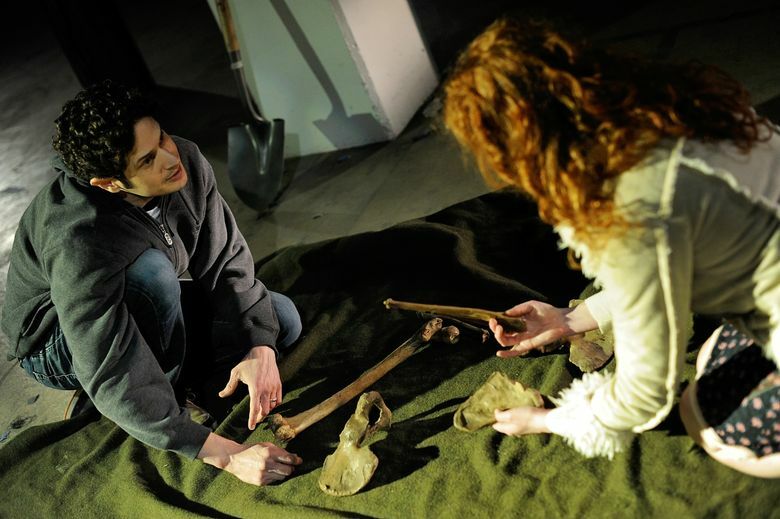 “Dump Site” is designed to give you the creeps, but Julia Nardin’s script is far more interested in inflicting psychological distress on its characters than spooking the audience. Reed Pickering (Simon Hamlin) is a mediocre horror writer grappling with his toughest project yet — a eulogy for his late father, who just committed suicide. That gets tougher when, along with his sister Charlotte (Evelyn DeHais), Reed uncovers a disturbing secret in his dad’s belongings that hints at a connection with a teenage girl (Rebekah Boroughs) who disappeared in the early 1980s. By Julia Nardin. Through Sunday, June 7 at an undisclosed Sodo warehouse (address provided after ticket purchase); $35 (206-747-3121 or seattleimmersivetheatre.org). In the messy confines of Paul Thomas’ storage-unit set (one of several smartly designed spaces inside the Sodo warehouse you only get the address to after you buy tickets), audience members can look for clues by rummaging through the possessions of a dead man. But you’d be advised to keep your eyes fixed on the actors as the play veers from grisly crime mystery to a painful rumination on loss and corrupted memories. While Reed retreats to the comforts of fiction, Charlotte needs to confront the horror and the way it redefines her past. Hamlin and DeHais give charged performances, every line a potential dagger thrown at the other person. These interactions occasionally threaten to become overwrought shouting matches, but director Gin Hammond is mostly successful at attenuating the powder-keg emotions. Audience members are outfitted with black bird masks made of molded plastic, an effective if not particularly comfortable way to transform the participants into a pack of unnerving, faceless voyeurs. Along with ominous VHS recordings and labyrinthine paths of cardboard boxes stacked to the ceiling, it’s one of many little touches that make “Dump Site” a memorable experience.